What about tips for growing? 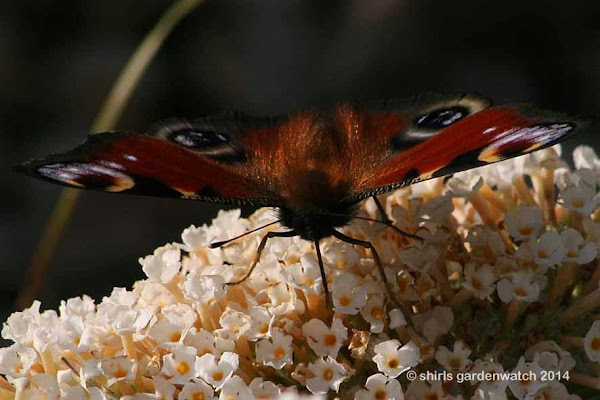 As with any summer flowering plant, deadheading faded flowers is always worth the effort especially as new flower buds get a chance to grow and open their nectar rich, flowers. I must remember to regularly check my plants in 2014. I must also check back here on the pruning section from the Thompson & Morgan website below. 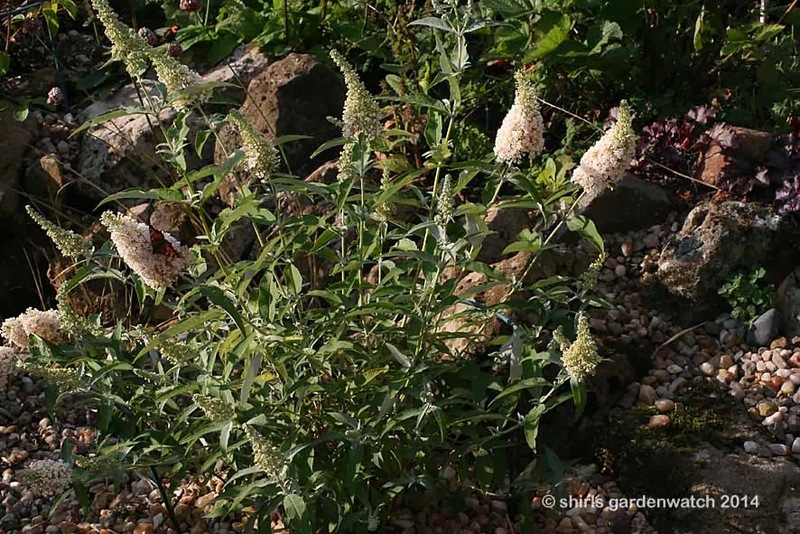 Buddleja plants are really low maintenance, but they do benefit from pruning in early spring. Pruning will prevent them from becoming leggy and helps to maintain a nice compact plant. 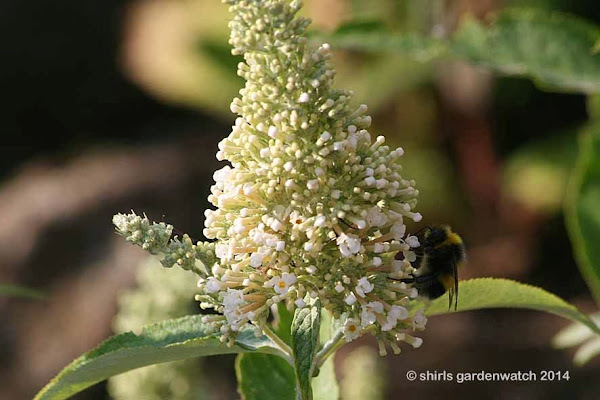 Buddleja plants flower on new growth, so pruning will also help to promote lots of new stems that will flower in the same year. Prune Buddleja in March, once the hardest frosts are over, as the new growth begins to show. Firstly remove any dead, diseased, damaged, or weak stems, before pruning all off the remaining stems back to form a low framework. In future years you can simply shorten the previous season's growth back to 2 pairs of buds from this permanent framework. A top tip for pruning buddleja is to always use clean, sharp secateurs and make your cuts squarely, just above a healthy pair of buds. Peacock & Large White butterflies, 0:49 with gentle background music, try 720p HD quality. 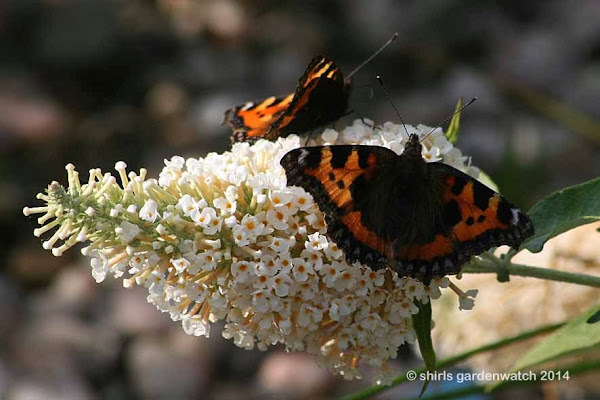 Ah… that was refreshing look back at the summer especially watching the video, butterflies bring something special to the garden don't they? However, there is plenty of wing flapping to be seen at the moment as numbers of garden birds at the feeders increase day by day. Ha-ha… that’s until I sit down and count them for an hour - then the garden goes spookily quiet! I wonder how that works then - all too common a story too by what I hear in comments and from other bloggers. If it is as hardy as a 'normal' buddleia it should be fine. WE have several larger ones growing on the plot as a result of sticking prunings in the ground. (Not buzz ones so mo restriction). Each year I cut them back to about a foot high. Last years they were covered in peacock butterflies - more than I had seen before - but hardly any tortoiseshells. 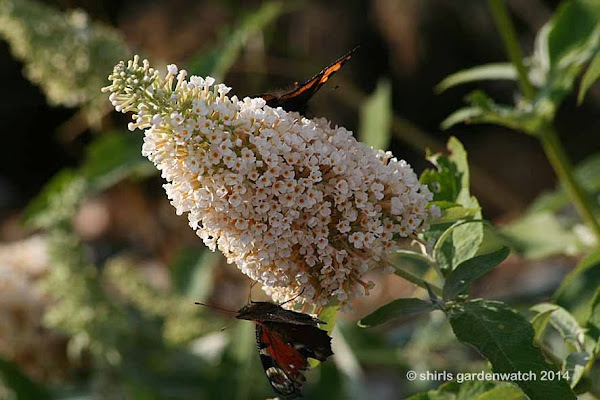 Love buddleia and have many in my garden, the white one did particularly well attracting bees, moths and butterflies. It was lovely to look back at a glorious summer too. I shall be sitting down for the BGB with the RSPB and like you shall expect the small number of birds that I do normally see to hide! They are hardy plants. They are becoming invasive in some areas around here. I have had a purple one for years. I don't remember the variety. I do cut it back every winter. The butterflies, bees, flies and birds use this shrub. I can't help but to like it even if it does go rogue. Not heard of this one Shirl but it looks a real butterfly magnet. Let's hope that we get a touch of real winter soon and that your new hebe comes sailing through. Sue, I’m hoping that’s the case. Yes, I read about your successful cuttings of your buddleja and remember how you couldn’t count all the butterflies for the count when it was on… Wow! Anna, I’m hoping so. Last year was a bit wet up here when it was in flower. Being established in my garden now hopefully it will flower earlier. I saw it on the 2013 TV coverage of Hampton court and had kept my eye out for it in garden centres. They were on available late on the season.